Today Federal Communications Commission Chairman Pai announced that he is proposing to designate for hearing several issues surrounding the Sinclair-Tribune proposed merger. Mr. Pai stated he was doing so because "certain station divestitures that have been proposed to the FCC would allow Sinclair to control those stations in practice, even if not in name, in violation of the law." Commissioner Rosenworcel rapidly signaled her support. Cheryl A. Leanza, UCC OC Inc.'s policy advisor stated, "The Commission's proposed action is appropriate, as UCC's media justice ministry has pointed out from the beginning, because this transaction deserves serious scrutiny. This is good news for anyone who values competition and multiple viewpoints in news and on television." Typically, designating a proposed merger for hearing means the transaction is withdrawn, and UCC OC Inc. hopes the same action follows today's announcement. Leanza noted, "All of the merger's opponents deserve recognition for their steadfast opposition to a merger that was previously believed to be inevitable." 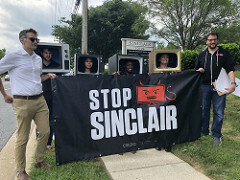 Leanza continued, "While we celebrate the likely end to the Sinclair-Tribune transaction, the FCC has taken steps in the last year to invite this kind of abuse of its rules by repealing previous policies that prohibit stations from, as the Chairman said, 'control[ling] stations in practice, even if not in name, in violation of the law.'" In particular, under Chairman Pai, the FCC adopted two decisions that treat stations as independent from each other even if they jointly sell advertising time or jointly produce news (to name two examples). The FCC should quickly stop allowing companies to end-run around its rules as Sinclair proposed to do. And Congress should follow suit, by ending its requirement that the FC grandfather existing combinations of this type until 2025.